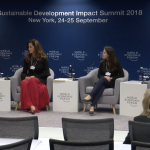 The 2018 Sustainable Development Impact Summit took place in New York during the United Nations General Assembly with the goal to shape an agenda for action and serve as a platform to harness cutting-edge scientific, technological and digital innovations. Agrosmart was invited to join the panel “How the Creative Industry Can Invigorate the Sustainable Development Goals Agenda”, together with representatives from DANONE, United Nations and Devex. “Purpose” is considered a leading global trend in all industries, with consumers increasingly aligning buying with their beliefs. Millenials expect brands to lead the movement for change and address critical problems. According to the 2017 Edelman Earned Brand study, 57% of consumers around the world will buy or boycott a brand solely because of its position on a social or political issue and 30% say that they make these belief-driven purchase decisions more than they did three years ago. As social consciousness continues to grow, companies around the world are pushed to increase transparency and positive impact. How can industry leaders be change-makers and scale up positive impact for a sustainable future? What’s the Sustainable Development Goals role for the future of our planet? How can companies communicate better the SDGs progress with the public? 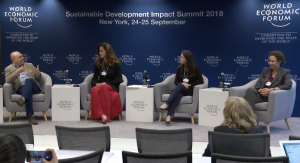 In this panel, Agrosmart’s CEO, Danone’s VP for Corporate Affairs and Business Sustainability Integration and UN’s Special Advisor have discussed global SDG advancement and the company’s role. “Agrosmart is deeply committed with the purpose of generating positive impact in the food value chain. We apply data science in the agricultural value chain to generate intelligence for different stakeholders across the agricultural value chain, promoting a more sustainable, productive and climate-resilient agriculture. We use the SDGs as a framework in our business to support food and agriculture companies accomplish their sustainable goals. I believe that this is a continuous process that companies must be committed to in order to create real change and impact” says Mariana Vasconcelos, CEO of Agrosmart. · Claudia Romo Edelman, Co-Host, CBS Interactive, USA. · Mariana Vasconcelos, Chief Executive Officer, Agrosmart, Brazil. · Emmanuelle Wargon, Senior Vice-President, Corporate Affairs and Business Sustainability Integration, DANONE, France. · Raj Kumar, President and Editor-in-Chief, Devex, USA. About Agrosmart: Agrosmart monitors crops to translate nature and unleash the power of data in the food chain through a proprietary approach based on genetic material, soil type and microclimate. From research and development to the food Industry, the company delivers intelligence across the agricultural value chain, promoting a more sustainable and climate-resilient farming.